Samsung has presented its fifth generation Galaxy S phone in the Mobile World Congress this year in Barcelona. 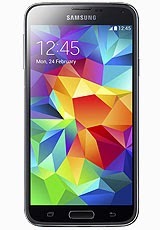 This phone it released with the name Samsung Galaxy S5. It has announced with a lot of new features and sensors for enhance the daily life easiness. Samsung Galaxy S series is commonly known as the series of flagship phones. The phones with a title of Galaxy S are the most wonderful phones of the time and these are put in the ground to compete and face other monsters from big mobile phone giants like Apple and Nokia etc. Samsung has a tradition that it announced its latest Galaxy S with a new version of Google Android operating system. 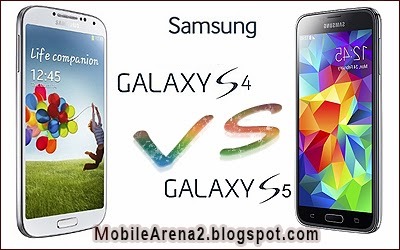 Last year in March (2013) Samsung had announced Galaxy S4 with Android 4.2.2 Jelly bean. This phone was also a leader of the smart phones manufactured by the Korean company. 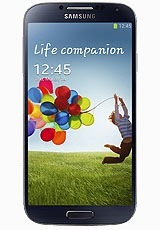 Samsung Galaxy S4 has gained much fame for its thin borders and faster speed of processing . Galaxy S4 had the most advanced technologies of controlling your phone by gestures of your eyes and hands. Galaxy S4 was announced by 1080x1920 pixels that was a wonderful invention in mobile display resolutions. The Super AMOLED screen with 16M colors was also a charm for the Galaxy S4. This phone was announced in two different versions with respect to CPU , one had 1.9 Ghz Quad-Core processor while the other had 1.6 Ghz Quad-Core processor. 13 Mega pixels camera with amazing feature of Dual shot and a 2 MP front facing camera was also an attractive thing for mobile phone lovers last year. This is the time for a 5th generation Galaxy S device and the next big thing from Samsung is officially released in the famous city of Spain on the ocean of MWC 2014. This is Samsung Galaxy S5 that has announced with Android 4.4.2 kitkat flavour . 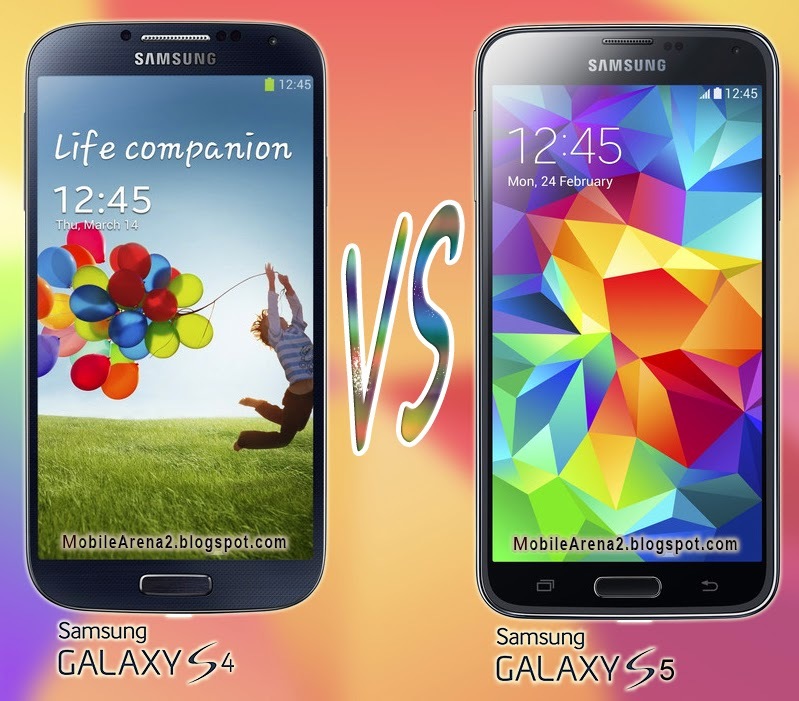 Here is a comparison table between Samsung Galaxy S4 and Galaxy S4. Samsung Galaxy S5 has the same pixels resolution as the Galaxy S4 . It was being expected that this phone would have more sharp display than its predecessor but the expectations were not true. But this phone has an advancement in the field of Camera, chipset and sensors. This phone has 16 Mega pixels camera that has a long list of stunning features. In the specifications of camera there are a 1/2.6'' sensor size, 1.12 µm pixel size, Dual Shot, Simultaneous HD video and image recording, Geo tagging, touch focus, face and smile detection, image stabilization and the famous HDR options to enhance the picture and video qualities. These specifications put this phone into the race of digital cameras. Samsung Galaxy S5 also has a faster processor that is 2.5 Ghz Quad-Core. This processor is Snapdragon 801 that will introduce the user a new world of speed and charm. It will accelerate the heavy operations on the screen of this phone. It will give a new taste of playing hefty games. It will also provide a new age of doing bunch of multi tasks simultaneously without any lag. The new temperature, humidity, gesture, and heart rate sensor pared with accelerometer, gyroscop, proximity, compass, barometer will also make this phone a substitute of many gadgets . Samsung officially released a press note in which it says that the back of the GS5 is "leather-like," which basically means that it's a decent-looking polycarbonate build. While Samsung has already used the similar material on the back of "Galaxy Note 3" and it tablet "Note 10.1 2014 edition", but the look and feel this time is slightly different. it's not quite as soft as the new Notes, and its small dimples actually remind us the design of the first tablet of Google named as "Nexus 7". Though the sides have a metallic finish, company confirmed they're actually made from a blend of polycarbonate and glass fiber. So, this will provide more durability than many others of Samsung's previous Galaxy phones. One of the hottest talking point for the new Samsung Galaxy S5 is its new fingerprint scanner and it is obviously the response of "Apple's Touch ID" that the American company has introduced in iPhone 5S. Apple's not the only manufacturer to have integrated a fingerprint scanner, and we're sure it won't be the last. In this case, Samsung's scanner, which works by swiping your finger down over the home button, has a few handy use cases. In addition to the obligatory phone unlock option, it also lets you fingerprint-protect a private data locker on your phone. It is interesting news for many of us that Samsung also announced a partnership with PayPal which allows you to make online payments using the fingerprint method. In very first contact with the Galaxy S5, we examined that the phone picked up fingerprints most of the time, as long as we did it slowly enough. if you do swiping on the button quickly, your chances of success will likely drop.